Audio books have become a great tool to use in the classroom for offering differentiated instruction, variety, and fun! 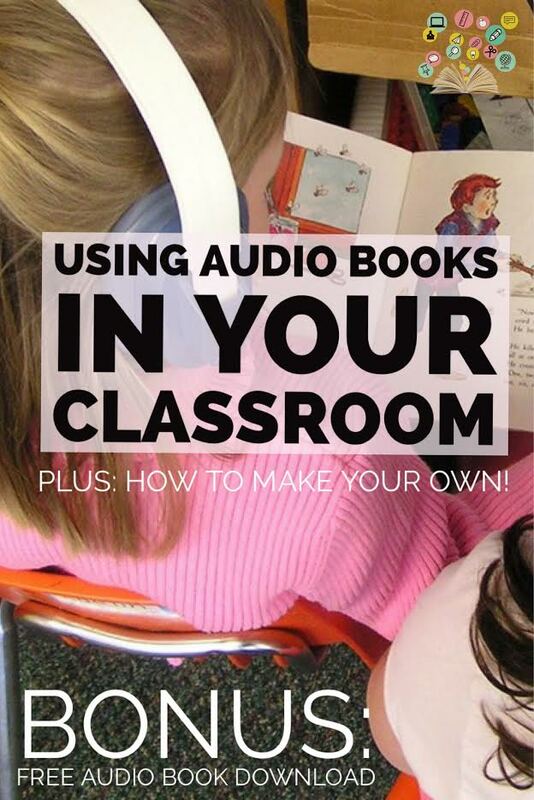 In this post I'm going to share with you some of my most favorite ways to use audio books in your own classroom and how making your own audio books is surprisingly easy! 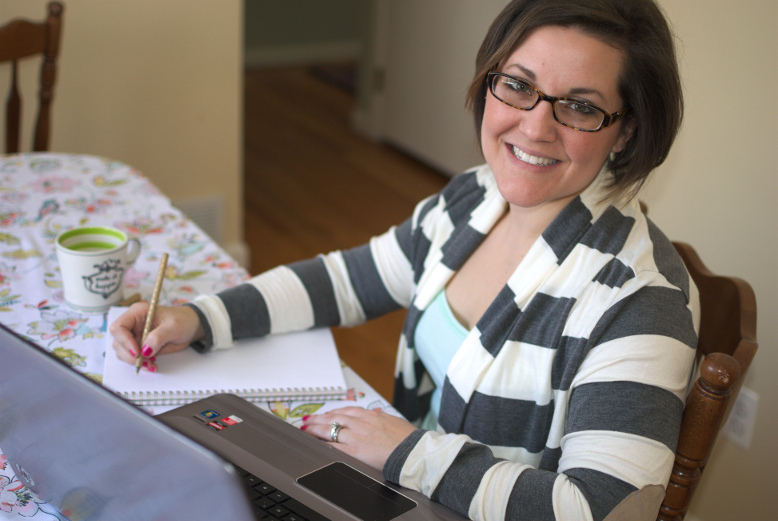 I'll walk you through a few simple steps to how you can customize your own audio book library! Oh - and if you stick around to the end, I'll even give you a free recording of one of my favorite books! There are several reasons why I think mixing in audio books in your reading instruction can help your students. Audio books offer a great model of fluency and expression. Students hear the way a text should be read and can learn from it, and apply it in their own reading. Audio books allow students to focus on the content of the text, not the act of reading. This is especially helpful in the content areas (science, social studies...etc.). 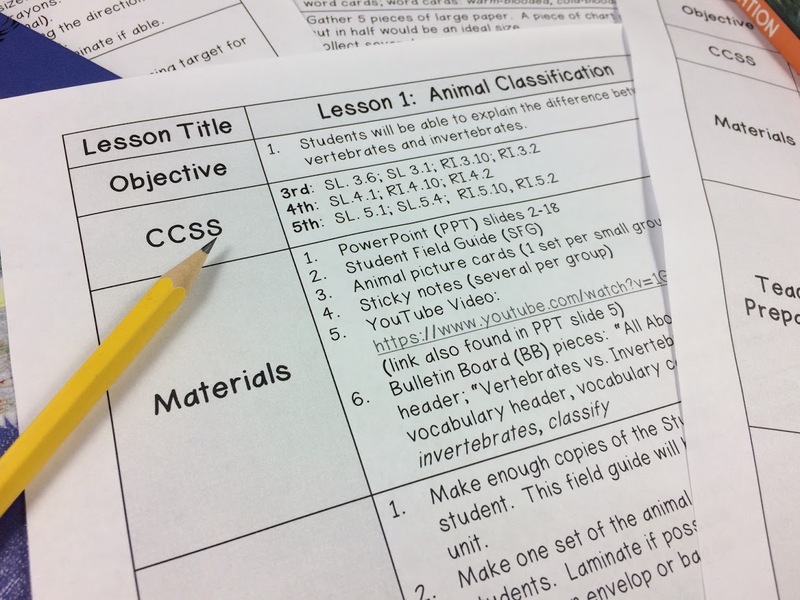 Students are expected to learn and understand their grade level's content information, but many struggling students are unable to read the texts being used to teach that content. Being able to listen to it will help break down any reading barriers that may get in the way of a student's comprehension of the subject matter. Audio books provide additional ways to expose students to the same information. Students benefit from hearing the same information in different ways. Audio books are just one more way to present new information to a student. Audio books develop listening skills. Students learn to focus on what they are listening to and draw out the key points. Giving students graphic organizers to complete while listening is a great way to help them focus. One of the most obvious ways to use audio books is in a listening center. 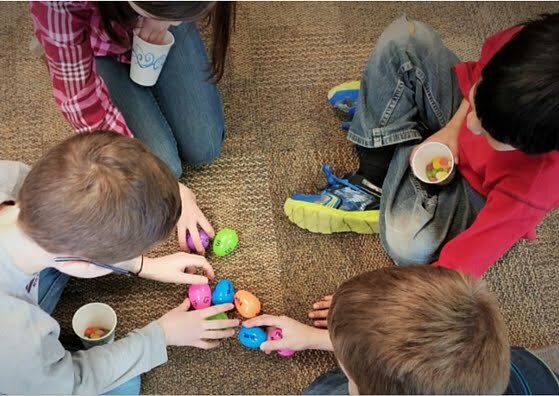 In small groups or even as individuals, students can follow along to an audio book and then complete comprehension activities after completing the book. You can also use audio books in small novel groups. Students can meet on a regular basis to listen to a book together. As a group, students can complete projects and activities together in response to their novel. If you are creating your own audio books (more on that in a moment), you can even record yourself asking discussion questions within the audio track, prompting students to pause the audio book to stop and talk about what they are reading. 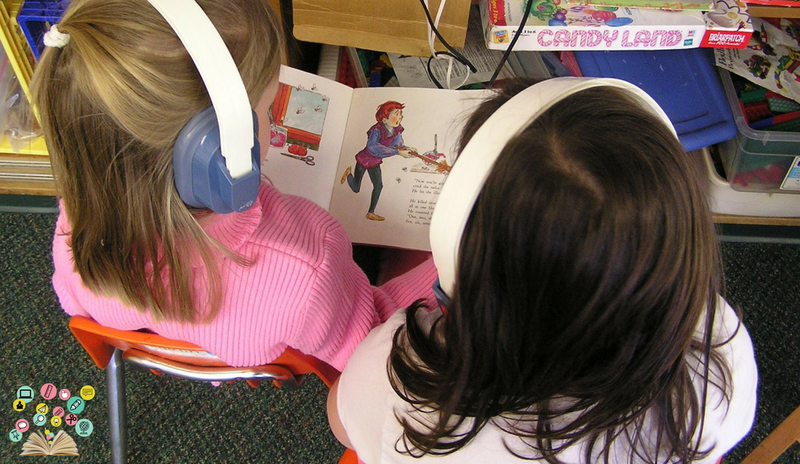 Use audio books to help students work on their fluency. To do this, provide students with a copy of the text and as the book is read, students will also read out loud with the book. Encourage the students to mimic the reading style on the audio with their own voice. Create your own audio track by recording fluency phrases for students to practice reading. Another way is to use audio books in the classroom is to have the students create some sort of visual representation of what they are listening to. Have students illustrate scenes of their story or illustration important concepts learned. Students can also create word clouds to represent key ideas, characters, events...etc..from the text. Students may need to pause the audio to complete potions of their visual representation. This strategy gives students the opportunity to internalize what they are learning and represent it in a way that makes sense to them. Have students create their own audio book! Provide students with a recording device (there's an app for that!) Allow students to record themselves reading a short book, a poem, or their favorite part of a book. If working with a longer book, assign different students a section to read, and then connect the audio clips together to create one reading of the book! Have a class celebration to listen to the completed project. Students LOVE hearing their voice. Send audio books home with students! If your school is able, load an audio book file onto an iPod, tablet, or other device to send home with your students. If making your own audio book, you can easily upload an mp3 file onto a google drive and share the link with your students to take home to listen to. You can easily differentiate your instruction using audio books. While some students read the printed version of a text, struggling readers can benefit from the audio version. A student's listening comprehension is typically beyond what they understand in print. Audio books keep struggling reader's from falling behind in the content areas. Another unique way to use audio books in the classroom is to use it as an incentive. Instead of offering a prize or a sticker to your students for reaching a reading goal or milestone, allow those students to spend some special time in the classroom (perhaps during lunch) listening to an audio book together. Students can get comfy and sit in beanbag chairs, carpet squares, or other fun places in your room with a snack and listen to a book as the reward! You can even make it a whole-class reward! It teaches students that reading is a reward, not a task! Start a new book by listening to the first few pages or first chapter. Many times audio books have background sound effects to make the story come alive. Doing this gets the students hooked on the book! You can use it as a teaser to get students excited to read the rest on their own or in small groups. I know this sounds like a lot of work, but it is surprisingly easy. I just did it myself for the first time and it didn't take me as long as I thought it would! Having the ability to make your own audio book allows you to offer the exact audio text, whether it be a full book or even just excepts and directions. You can also save them as mp3 files to play on any device available to you in your classroom. I downloaded a free app on my iPhone called "Voice Recorder" (creative name, huh?). I'm sure there are others, but this one was free and got the job done. The app is super simple to use. It basically works as if it were an old school tape player. When you're ready to record, you hit "record" and start talking! I suggest recording the book in chunks, stopping and saving every few pages as a track. Because your students are following along, you want the reading to be completely accurate. It's the worst to get almost to the end and make a mistake, having to start all over again. That's why in the second iPhone screenshot above you see part 1, part 2, part 3, and part 4. I'll show you in a minute how you can string them all together to create one recording. Once you've recorded each section of the book, you can upload them to your computer where you will complete the process. It's not showing in the image above, but in the far right corner of your phone screen you will see a gear symbol. If you click on that, it will bring you to the third iPhone image you see above. I chose "upload by wi-fi sync." This made it super quick and simple to upload the recordings to my computer. Your phone will prompt you to go to a website where the files will automatically download. After you've downloaded the files to your computer, it's time to put all of the recordings together. I used a free online site called Audio Joiner. There's no software to install on the computer, no logging in AND it was super easy to use. Once you're on the site, simply click on "add tracks"
From there you will select the tracks that you want to string together. The files will open up in the browser and you can easily reorder that tracks if you need to. If you need to trim off parts of the beginning or end of the each clip, you can drag the little blue hands in. Once you have the clips all set, simple click on the third step, "Join" to combine all the clips together in one file. I should also mention that I used a lapel microphone to get quality sound in my recordings. Although it is not necessary since your phone has a built in microphone, I find that it really improves the sound. I used this relatively cheap microphone (affiliate link) that you plug into the earphone jack. And that's it! From there you can save the mp3 file onto any digital device for your students to use. Now - for that free audio recording I was telling you about. I wanted to try it all out for you first to make sure it was as simple as I'm making it out to be, and - it is :) I recorded a book that I used in my Civil War and Reconstruction Unit when discussing the Underground Railroad, Henry's Freedom Box. From start to finish, the whole process of recording, editing, and saving took me under an hour! And that included my time spent finding the Audio Joiner website to combine all my recordings. When I recorded this, I also decided I wanted to add a little background music that matched the mood of the book, so I used a royalty free song from Bensound. I simply played the music from my computer while I read the story. Since I was using my microphone, the microphone picked up the music just fine. Adding background music is totally optional, but definitely a nice touch once you get the hang of the whole process. 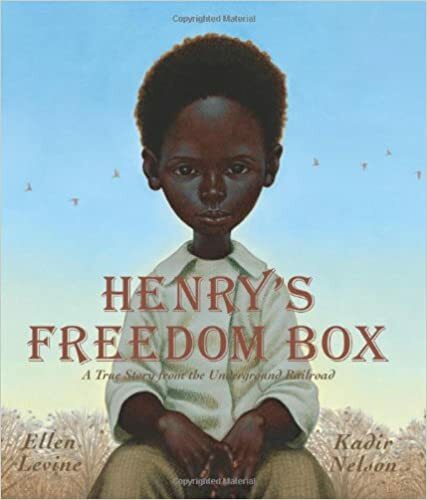 If you'd like a FREE copy of the audio recording of Henry's Freedom Box to use in your own classroom, simply fill out the form below and I'll email it right over to you! Plus - as a BONUS, I've included a cheat-sheet with all of the directions listed in this post for how to make your own audio books in a snap! What are some ways that you use audio books in your own classroom? Have you ever tried to make your own?? ?